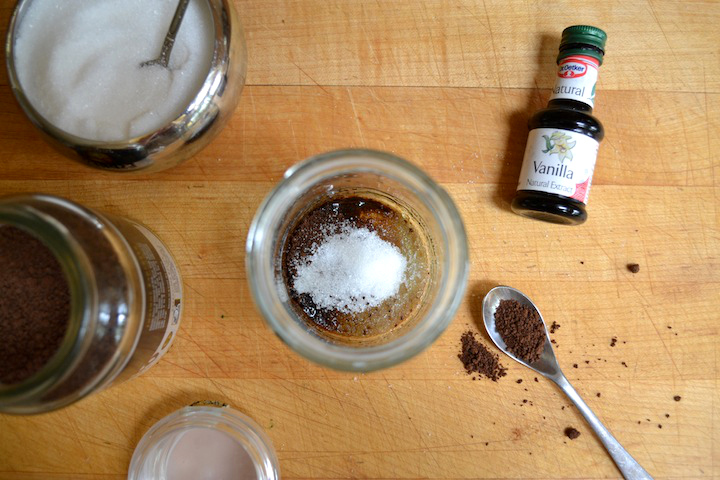 Add your coffee granules (1 teaspoon, or shot of espresso) and sugar to your jar. Mix with enough boiling water to dissolve (omit if using shot of espresso), then leave to cool. Add your vanilla essence to taste, and when completely cooled (it doesn't take long) add plenty of ice. Top up with milk, give it a stir, pop in your straw and you're good to go! How easy is that?! These are definitely going to become regular Sunday morning drinks for me, tasting just as good as a coffee house iced latte - they're going to save me some pennies too. I only had vanilla essence on hand when making these, but I'm going to buy some coffee syrup or tasty ice cream topping sauce to make more indulgent versions. The essence did work well, but definitely needed the sugar to add the sweetness I love. Have you tried making your own iced coffees at home? Which flavours should I try? These sound so good! I've recently bought a coffee machine and I keep telling myself I need to get ice and make these. I've tried to make my own Iced Coffee's before and always failed, never thought of Vanilla Extract! Going to try this in the morning to keep me away during my commute! Such beautiful photography in this post too!